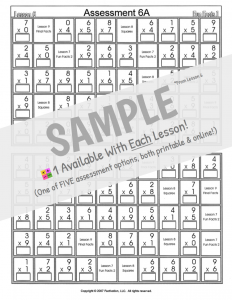 Every Factivation!® lesson includes a wide variety of printable options, each designed for a specific purpose. The workpages, activities, and assessments provide targeted practice with the facts from the current lesson, deepening students’ understanding through repeated exposure and varied experiences with the same Addition facts. Many also spiral back to review facts from previous lessons, while others connect the current focus facts to their Subtraction counterparts. TRY FOR FREE! All highlighted pages are part of our Sample Lesson. JOIN NOW for access to ALL printables, videos, games, and more! See all printables for this segment. Track overall fact mastery with the one-of-a-kind Factivation!® for Addition Pre/Post Assessment Tool. Easily diagnose fact gaps, prescribe needed lessons, and monitor progress. Use as both formative and summative measures. 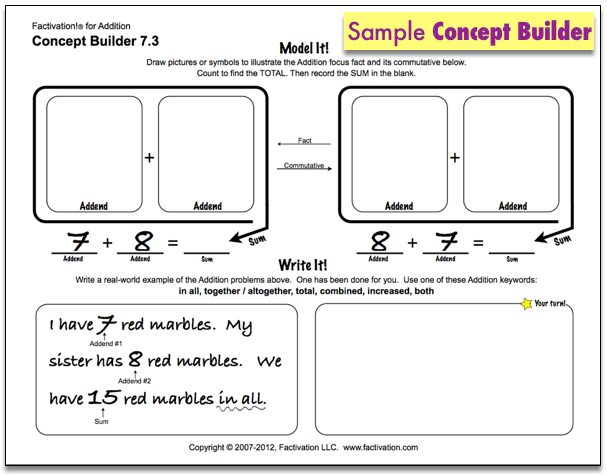 The purpose of the Addition Concept Builders is to provide hands-on practice with Addition equations. Students examine addends and create models to demonstrate the quantity. This can be done concretely using small objects or counters. 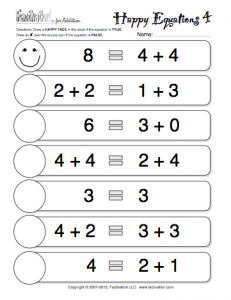 Alternatively, students may draw the quantities using symbols or tallies. 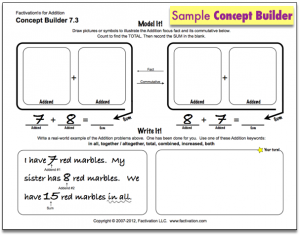 The Addition Concept Builders include the following vocabulary: addend, sum, and commutative (property). Increase rigor and relevance for your students- Complete this activity with students working in partners or small groups to create a real-world example that will be presented to classmates. Lay the foundation for each lesson! Use the Adderpillar™ mat (and any available manipulatives) to give students hands-on experience building Addition facts. PROCEDURE: Read Eric Carle’s The Very Hungry Caterpillar if available. Explain to students that they have a very hungry adderpillar™ who likes to eat beans (adapt to fit your manipulatives). 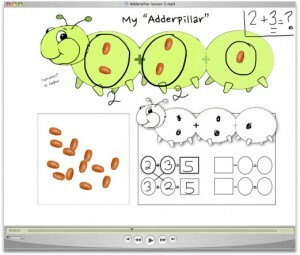 Model: Write one of the current lesson’s focus facts on the board: 2 + 3 = ___ for example, and say, “When our adderpillar™ first woke up, he ate 2 beans.” Point to the “2” in your equation and place 2 beans in the first section of the adderpillar’s body. Say, “Our first addend is 2. By 10AM, he was hungry again and ate 3 more beans!” (Point to the “3” in the equation and place 3 beans in the second section of the adderpillar™. Say, “Our next addend is 3.”) Ask, “How many beans did he eat in all? What is the SUM?” To find the sum, students can use the third section of the adderpillar™ to deconstruct the fact into familiar parts. For example: Students may already know 2+2=4, so by moving one bean into the third section of the adderpillar™, they can see and interpret this fact as 2+2+1. (Helping students learn to deconstruct facts in this manner allows them to solve unknown facts with more efficiency and deepens understanding of the concept of Addition.) Refer back to your equation and ask students to find the sum. Record. Continue modeling with more facts as needed. Practice: Have students practice fact-building independently or with a partner using their Adderpillar™ mat and manipulatives. Place the Adderpillar™ mat and manipulatives in a Math center for continued practice. No need for flashcards! 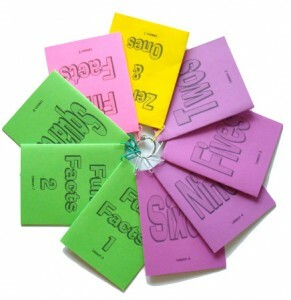 All Addition facts may be practiced using the foldable flipbook with each Factivation!® lesson. Store flipbook sets easily in a quart sized Ziploc and send home for nightly practice with a parent or sibling. Students may cut and color (if not printed on colored card stock, as pictured). 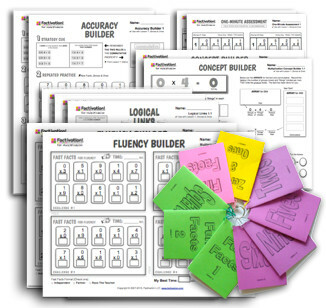 Inside each flip book is a strategy prompt (from the accompanying Factivation!® video lesson), Addition focus facts and commutative counterparts. Flaps keep answers covered, but flip up for easy self-checking of products. Watch a student demonstration of simple flipbook folding here! Perfect for Math Stations or as a purposeful indoor recess activity! 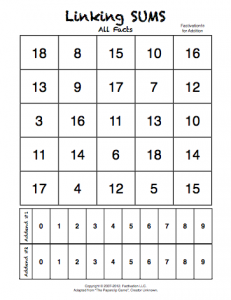 This printable game can also be sent home to play with family members. Store easily in a gallon ziploc with playing pieces (about 10 each of 2 colors) and 2 paperclips. The object is to answer Addition facts and get four sums in a row. Strategize (by using algebraic thinking) to block opponents plays. 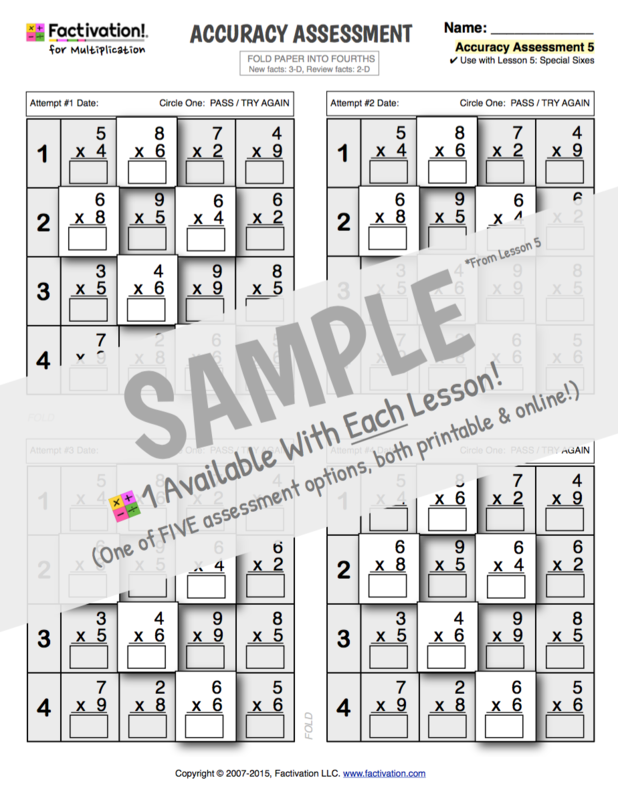 This game provides endless opportunities to review the focus facts and commutative counterparts learned in each Factivation!® lesson. Get full game instructions here. Once students are demonstrating accurate recall of sums (with consistency), administer the Accuracy Assessment. Have students fold paper into fourths. You only need to use one section. Find “Attempt #1” and allow a reasonable amount of time for students to complete. REMEMBER: this assessment precedes the Fluency Building segment, so speed is not being measured. 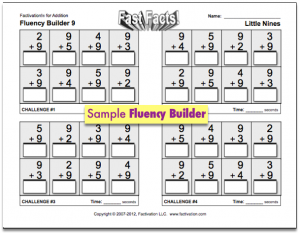 If students are ready, move on to Segment 3: Fluency Building. If not, SAVE the assessment, repeat the above, and administer “Attempt #2” when ready. Eliminate intimidation and build Mathematical confidence with the Factivation!® Progressive Assessments. 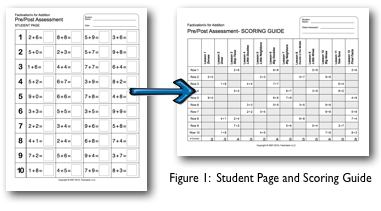 Like the Accuracy Assessment above, the Progressive Assessments do not test until it’s been addressed! In other words, they assess only facts for which the student has received instruction. Students answer all visible facts: those from the current and previous lessons. Future facts are present, but hidden under the lesson name in which the fact will be taught. Progressive Assessments are versatile. Teachers may utilize the entire page, or save time and paper by using the top or bottom portion only. 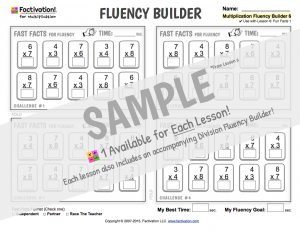 Each Factivation!® lesson includes an Addition (and Subtraction) Fluency Builder activity. 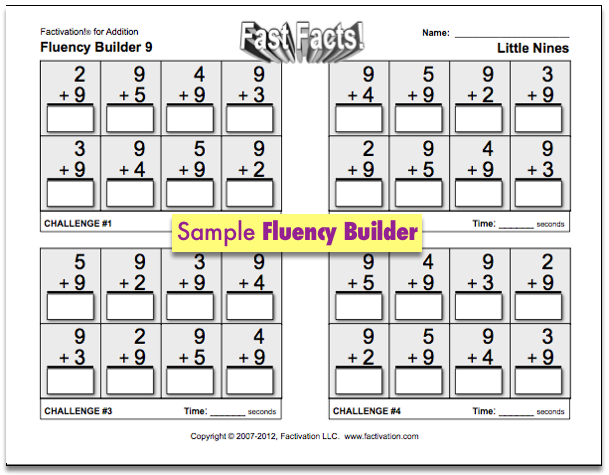 The purpose of this power printable is to build automaticity with this lesson’s focus facts. 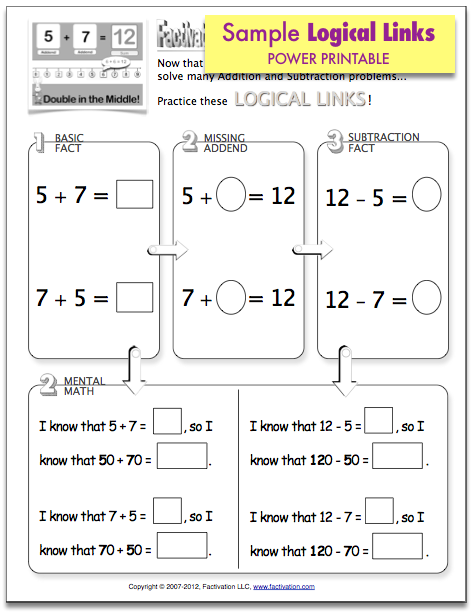 The same printable may be used daily to build fact fluency with the facts from the current lesson. This activity may be done with student partners or in a “Race the Teacher” format, which students really enjoy! It can also be completed with a partner or individually. 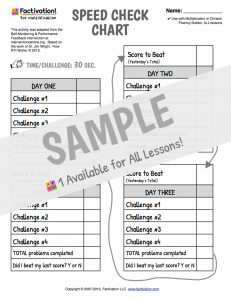 The NEW Speed Check Chart (see below) can accompany this printable to provide a research-based, highly motivational method of practice in which students chart their own progress from day to day. Paper-saving tip: Print one Addition fluency builder per lesson and place under a page protector for repeated use with a dry erase marker! Educational research has shown that one of the highest probable yield strategies for improving academic achievement is to have students track their own progress. The Speed Check Chart allows students to do just that and was adapted from the “Student Speed Check” activity from interventioncentral.org. 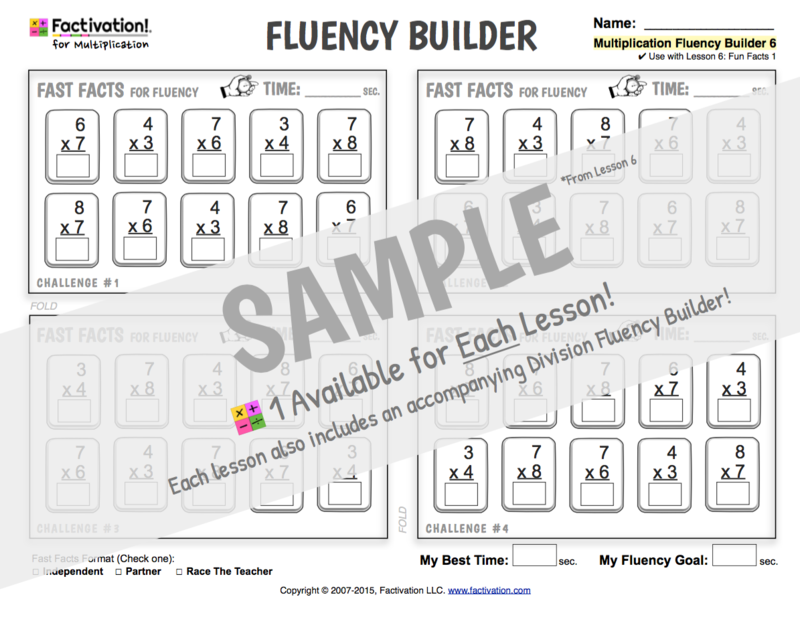 Use it daily with your Fluency Builder activity to increase both speed and motivation. 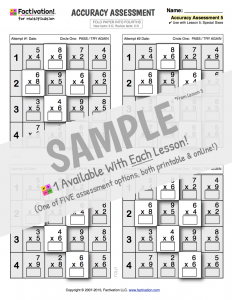 Looking for an incredibly quick way to determine lesson mastery? The Factivation!® One-Minute Assessments are designed to do just that! 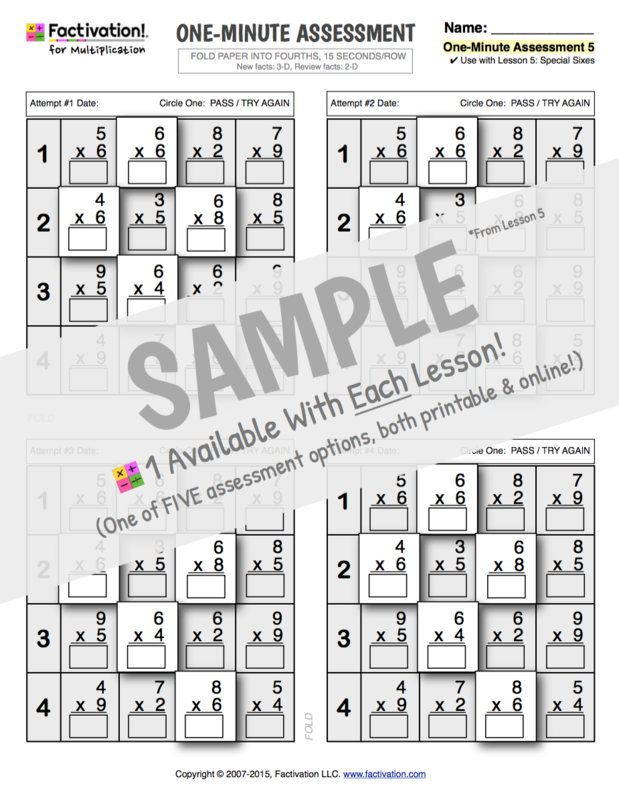 Fold the One-Minute Assessment page into fourths and direct students to “Attempt 1″. Allow 15 seconds per row for completion. (The assessment takes one minute total.) Assess mastery by looking at the “raised” 3-dimensional boxes. Spot-check the 2-D boxes (facts previously mastered) for retention. Circle “Pass or Try Again” at the top. If needed, save papers, reteach and move onto “Attempt 2″ when ready. The Factivation!® One-Minute Assessments provide teachers with an efficient, yet accurate assessment of understanding. 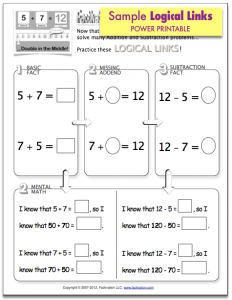 Begin with a think-aloud when presenting the bottom portion of Logical Links pages…”Class, we learned in Lesson Eight that 5 + 7 = 12, so I know that 50 (5 tens) plus 70 (7 tens) is 120 (12 tens) – write 50 + 70 = 120 on the board and underline the 5, 7 and 12 in the addends and sum. 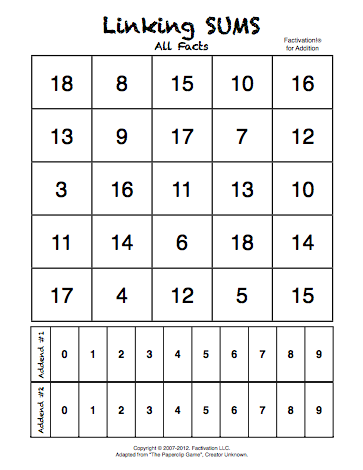 If possible, demonstrate using tens place value rods. Knowing the basic fact, 5 + 7 = 12, helps me to calculate the sum of this larger problem using my brain!” Repeat this procedure for the remaining mental math problems, as needed. 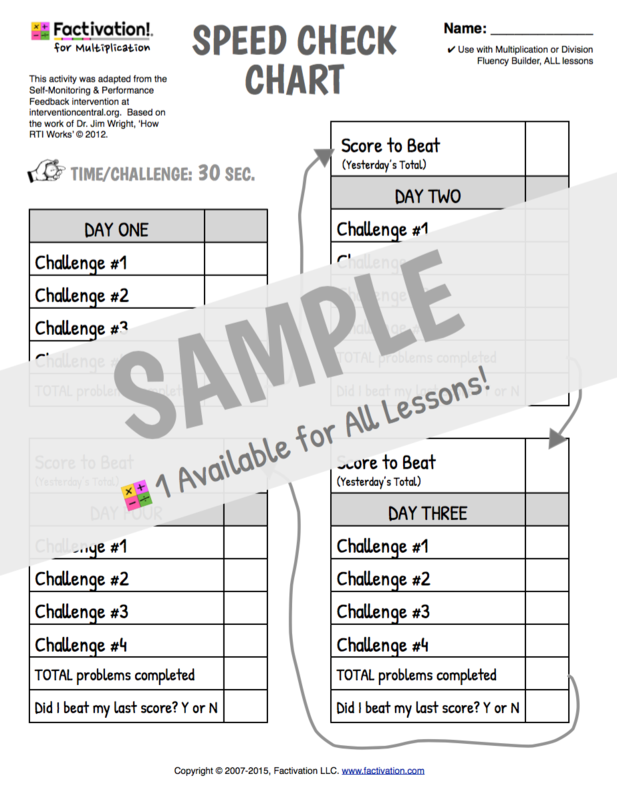 The NEW Speed Check Chart can accompany this printable to provide a research-based, highly motivational method of practice in which students chart their own progress from day to day. 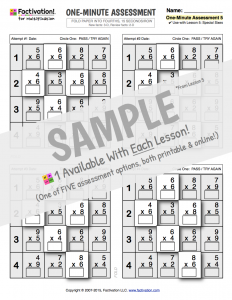 Paper-saving tip: Print one Subtraction fluency builder per lesson and place under a page protector for repeated use with a dry erase marker! 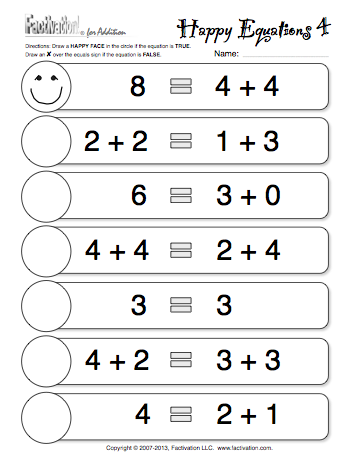 Designed to address CCSS 1.OA.D.7, the Happy Equations page that accompanies each lesson can be done individually (following instruction), in pairs or small groups (to generate Mathematical discussion among students), or as a whole class activity. Present one equation at a time and take a class vote on whether the equation is True or False. If the class is in agreement, call on volunteers to prove their answer using drawings, modeling with objects, etc. If the vote is not unanimous, call on volunteers to debate and defend their thinking (following foundation lessons on how to debate fairly and respectfully). Arrive at a class consensus based on the “arguments” heard from both sides. If the equation shown is TRUE, students create a happy equation by illustrating a smiling face next to it. If FALSE, an “X” is to be drawn in the circle instead.